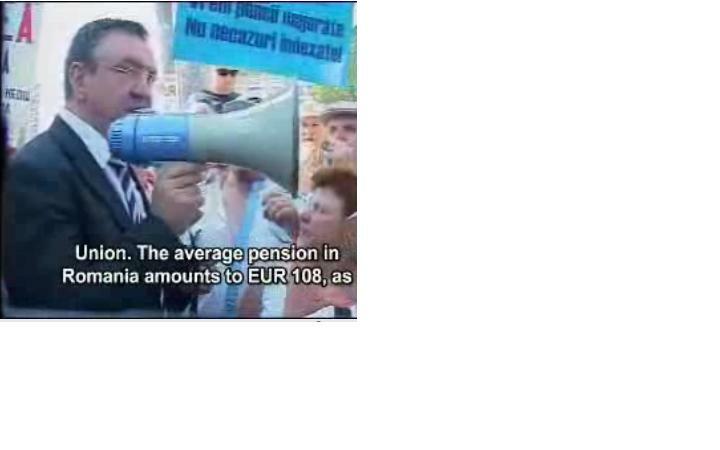 >Clientelism to lead to pension protest in Romania? uch sectoral divisions strikes me as likely to diffuse unless there is an obviously neglected majority group capable of taking collective actionand/or a highly unpopular priveged special group – in which case one would perhaps expense more generalized anti-political populist protest, if any. 4.6 million-strong pensioners, nearly half of whom have pensions below the minimum wage in the economy and 200,000 benefit from ‘specialpensions’, 70-80 to even 100 times the minimum one, which the governmentin office raised to RON 300 recently. Romania has several pension laws, the majority of which are drafted in such a way as to unnaturally and immorally favour various categories of political clientele. Justice, defence, home and foreign affairs and a few other fields benefit from ‘special’ pension laws. official, party head or lawmaker exercise their authority at the expense of the national interest, which results in the bulk of pensioners suffering the most from it. doesn’t apply to the overall pension law, unlike its salary counterpart. pensioners and the high unemployment rate, the decline in Gross Domestic Product and the 16 per cent rise in salaries over the past 12 months. Yet, it is exactly such aspects of the ongoing economic crisis that call for cutting special pensions down, as they threaten to bring the pension fundinto collapse. How come this reticence? to be a ‘legally earned right’ that cannot be touched by any new law. The fiercest I this respect are the magistrates, whose views drastically change when it comes to the apartments that quite a few Romanians purchase legally from the state. When such properties purchased both legally and in good faith have been claimed by the so-called descendants of the former owners, court rulings are handed down in their favour more often than not.In this instance, there is no such thing as the ‘won asset’ law , as if the Romanian state of 1996 is not the same with that nowadays. pensioners will no longer be among the living, which makes the blanket pension law into a ‘pensioner fairytale’. An interesting post by Manuel Alvarez-Riveraon on the recent Romanian elections – and the working of the new election system – can be found the Global Economy Matters blog here. Further interesting discussion can be found on the Fruits and Votes thread on the subject. There is also a link to Robert Elgie’s newish blog on semi-presidentialism. As the dust settles on the Romania elections, it becomes clear that the Democrat Liberals (PDL) have done rather better than predicted, running the Social Democrats (PSD) a very close second in terms of the popular vote. The kingmakers are the third placed National Liberals (PSD), who should, if ideology means anything, ally with the PDL, but whose relations with the presidentially sponsored party are so bad that they could equally work with the PSD, apparently. 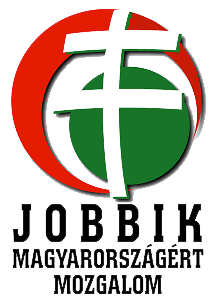 The only other party to make it over the electoral threshold is the Hungarian minority party (UDMR). The far right Greater Romania Party (PRM) is dumped out of parliament adding to a trend across the region for radical nationalists to be less than electorally resilient and, perhaps as as a consequence, to fade out of the region’s political systems, although the political comeback of the Slovak National Party in 2006 shows that it ain’t necessarily so. The big unresolved question is , of course, how global economic recession will crunch CEE political systems, but the tendency of extreme populists and radical nationalists to flop as larger blocs hoover up votes (also seen in Poland in 2007 and Croatia last year) suggests that the usual predictions of a return to atavistic extremism again may be wide of the mark. More telling perhaps was the record low turnout of around 40%. The final talking point is the new electoral system, a complex mixture of majoritarian single member district and (where – as in most cases – no one wins 50%+ in a SMD) proportional allocation of seats within larger electoral districts. The complex bit seems to be that the ranking of candidates for these proportionately distributed seats is done not by the parties themselves, but on the basis of a candidate’s vote in his/her SMD. You can thus be elected to represent an SMD if you are one of your party’s best perfomers in the region, even if you came a long way behind other candidates in the SMD. So for example, Ludovic Orban (PNL mayoral candidate in Bucharest in June) got 28% of the vote in one constituency but will become its Deputy despite being out-polled by the PSD and the PDL candidates in the constituency) his vote was one of best by a PNL candidate in that sector of the capital, so he is one of the first in line for that party’s share of the seats redistributed on a PR basis within that sector. PIt is not quite clear happens if two candidates get the highest vote for their party in the same constituency. PSD leaders with more of a local power base /levers of patronage to pull seem more often to have got into parliament via the 50% rule than leaders of either of the two Liberal groups. For this example and explanation I am endebted to Ed Maxfield.The Romanian electoral commission’s swanky website, which zooms in and out of an interactive map, shows which party won which SMD, but as far as detailed voting figures were concerned all I got was a Rezultatele nu sunt disponibile. That at least I did understand. Vehement complaints from representatives of the pro-presidentia Democratic Liberals in Romania, reports Nine O’Clock, (PD-L) that the opposition Social Democrats (PSD) and National Liberal Party (PNL), who currently form a minority government are colluding in the Electoral Code Commission, which is drawing up the (sort of) single-member (‘uninominal’) districts, which are an element in the new electoral system. Less than confidence inspiring to read that this body, which is loosely equivalent to the UK’s Boundary Commission is made up of representatives of political parties and works mainly on the basis of proposals agreed in deals between parties at local (counyt) level. Still, I suppose gerrymandering is a fairly well established practice in some ‘advanced democracies ‘as well…. >Romanian electoral reform: bitter fruit? 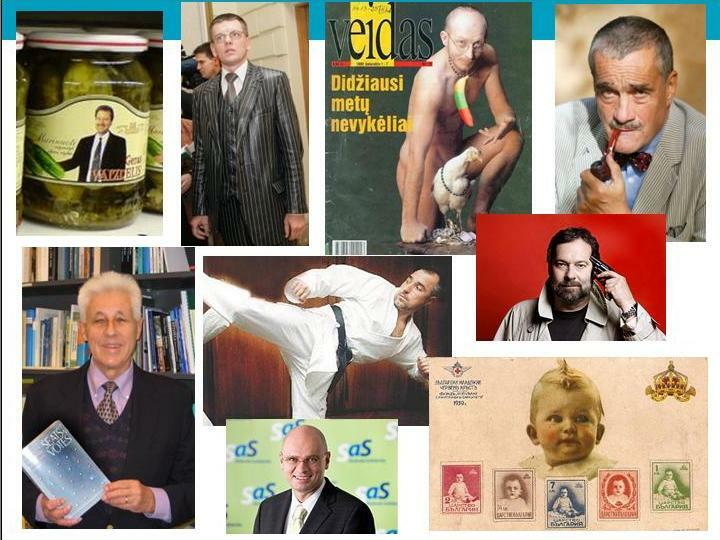 “The new Romanian electoral system really lives up to the old cliché, ‘a complex form of PR’. Here is an attempt to make sense of it, for which Marina Popescu takes primary credit. 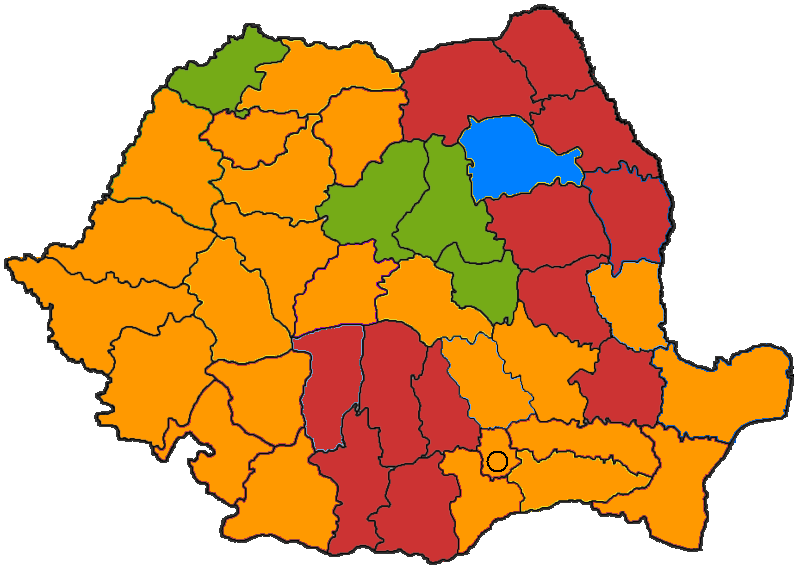 In autumn 2007, following years of popular pressure fomented by an NGO and the press for improving accountability and strengthening the linkages between citizens and elected representatives via the shift to a ‘uninominal’ (i.e., single-member-district) electoral system, the Romanian government proposed a mixed-member system. This would have been similar to the one used for the Italian Senate from 1993 to 2005, but would have ensured proportionality by having a variable number of at least 50 per cent of seats reserved for compensation, rather than just 25% as in Italy. This bill passed through parliament, but the President did not sign it. Instead, he called a consultative referendum, which unexpectedly proposed introducing a French-style two-round majoritarian system. Following a campaign appealing to concerns with improving accountability and aversion to party lists, 83.4 per cent of the voters supported the initiative but the turnout (at 26.5 per cent) fell short of the 50 per cent quorum required. The President then appealed to the Constitutional Court, which annulled the government’s electoral reform legislation arguing that the anticipated use of a national list amounted to an indirect election and was thus anti-constitutional. The current electoral system was adopted in February-March 2008 by parliament and is based on SMDs [Single Member Districts] only in the limited sense that the pre-1993 Italian Senate was. All 42 counties of Romania are divided into single-member districts and each citizen has a single vote to be cast for a candidate. Candidates win the seat automatically if they obtained over 50 per cent of the constituency vote. Nevertheless, the overall composition of parliament will be proportional: the two-tier seat allocation method used in the old closed-list system is retained, using the Hare quota at the county level, and then d’Hondt for nationally cumulated votes and seats remaining after the county-level allocation, with a five percent legal threshold applied throughout. Parliament can vary in size to guarantee each party the number of seats due to it proportionally. But parties may end up with more seats than that if they win enough seats with an absolute majority. Now here’s the really complicated bit. Besides the SMD outright winners, a party’s seats are allocated to candidates in decreasing order of the ratio between the absolute number of votes they received and the quota in the county where they ran. However, the seat allocation mechanism assures that every SMD is assigned a representative who actually ran for election in that district, and this goal is consistently prioritized over rewarding the highest vote getters. How will all of that work in practice? We don’t have to wait too long to find out: elections are due by the end of November. What I’m still left wondering about is a) whether – perhaps that should be, how in a Romanian context – SMD boundaries will be gerrymanded to maximise certain parties’ chances of winning seats straight off (thus presumably reducing those to be distributed by PR, although there seems to be some confusion of this – Alan Renwick’s explanation above clearly assumes this will not happen, but as other Fruits and Votes posters note, there is a constitutional stipulation abut population per depputy and not doing so would result in some SMDs having 2 representatives ; and b) whether the new system will create incentives for local notables to deploy heavy duty patronage and rule-bending. .… but couldn’t really be bothered to ask. The elections take place in one round only. 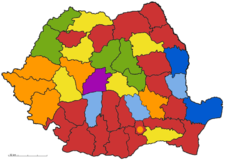 The national territory is divided into 42 electoral districts, corresponding to the 41 counties plus Bucharest. The electoral threshold for the parties is 5% (nationwide); there is also an alternative threshold which entitles those parties to enter Parliament that did not reach the electoral threshold but have winning candidates in 6 single member districts for the House of Deputies and in 3 for the Senate. In each SMD a political party has the right to sign up one candidate only; the elector votes by applying the stamp on one candidate for the House of Deputies and on one candidate for the Senate. The candidates who obtain in an SMD 50% plus one vote become MPs. If the party they belong to has not reached the electoral threshold, they do not become MPs. All the votes obtained by the candidates are added to the county and national electoral subtotal [Rom. zestrea = the dowry] of the party they belong to. (iii) At the district level, seats are distributed to the better positioned candidates of those parties entitled to seats, but only function of the electoral quota they obtained. The 64, 000 dollar (lei?) question is, of course, what happens to the large number of SMDs likely to be unfilled because no candidate has 50%+ of the poll and those SMDs where a candidate does win with 50%+, but his or her party is debarred from representation because it doesn’t meet the national threshold. Presumably, they will be redistributed using (using a proportional mechanism?). If so, the whole system is in fact likely to be in effect a ‘mixed’ election system with Finnish style open PR ‘lists’ with the interesting variant that the precise balance between deputies elected by SMD and those elected by PR will not be clear beforehand. The intention behind the new system apparently is to exclude ‘independent’ local political bosses dominating the system by having a party threshold and requiring a high (absolute) majority for SMDs. Personally, however I am still a little sceptical as it does not seem too hard for half a dozen dominant local independents to band together in a ‘party’. Indeed, the 50%+ requirement for elections in SMDs seems almost an incentive for heavy duty patronage and/or vote rigging on Russian lines. My colleague Prof Denis Deletant, who knows Romania and Romanian politics better than anyone at SSEES, also points that Romanian politicians have a habit of passing framework legislation and then filling in important details at the last minute, things may turn out differently anyway and we have all been losing sleep unnecessarily. So good night and good luck. >Romanian electoral reform: from pillar to (first-past-the) post? The Romanian parliament has, as expected, finally passed a new electoral law changing the country’s voting system from list proportional representation to what the Romanian are referring to as a ‘uninominal’ system – a single member district (SMD) first past the post system to be used for both Senate and National Assembly – oddly, the Romanian constitutional doctrine seems to be that to enjoy equal legitimacy both upper and lower house of parliament must be elected in the same way (exactly the opposite of how the Czech see things – the Czech constitution insists on different voting systems). The new ‘uninominal’ set up supersedes the mixed system previously legislated for but not signed into law by the President. Presumably, this one will meet with his approval. Things are not, however, as straightforward as they seem – the new system seems to have some distinctly odd features. For example there are electoral thresholds (5% of the national vote or six members elected in SMDs for parties) and a mechanism for redistributing seats involving a list, which seems to suggest that there will be some ‘floating’ seat. Does this mean that if a party wins 1-5 SMDs its candidates will be debarred? Will the second place candidate ‘win’? Unfortunately, it’s hard, however, to find any coherent English language account of the exact workings of the new system. The clearest one I could find was offer by Radio Romania International and that still leaves me confused. As it correctly notes, whatever its finer points the new more majoritarian system is likely to be less a political ‘flat tax’ solution sweeping out party corruption, as many commentators and most of the Romanian public seem to believe, than a measure empowering local political bosses at the expense of higher level party and state structures. A more detailed but still more baffling account of the new system is carried by SEEurope.net. Romania’s own electoral commission has a flashily designed website with an English version that boasts of its ‘young, dynamic and active team’ and even has a section on ‘electoral deontology’ (presumably a post-modern interpretation of elections?) but nothing in any language on the new system. Its most recent press release in Romanian is from 22 February. The premier electoral systems blog, Matthew Shugart’s Fruits and Votes is currently obsessed with the US presidential race and has nothing on Romania’s very interesting moves toward majoritarianism.